ATLANTA, Feb. 11, 2019 /PRNewswire/ -- Georgia Power Vice President of Environmental Affairs Dr. Mark Berry was presented with the 2019 Science Spectrum Trailblazer Award at the 2019 Black Engineer of the Year Awards (BEYA) Science Technology Engineering and Math (STEM) Global Competitiveness Conference in Washington, D.C. on Friday, February 8. Dr. Berry and other award recipients were recognized at the Technology Recognition Luncheon featuring Modern-Day Technology Leaders and Science Spectrum Trailblazers. The Science Spectrum Trailblazer Award is presented to leaders actively creating new paths for others in science, research, technology, and development. Recipients range from experienced executives who continuously seek innovative products and ideas to those who are breaking new ground at the midpoint of their careers and others who are recent graduates that show pioneering promise. They distinguish themselves by constantly setting their sights higher, striving to innovate and open doors for others. "Mark's passion for the development of people and technology continues to make an impact on the energy industry," said Chris Cummiskey, executive vice president of external affairs and nuclear development of Georgia Power. "Dr. Berry's impact portrays his continuous commitment to challenge the status quo in developing and implementing strategic and innovative solutions. The partnerships he has built and the projects he has launched contribute to how we're doing our part to ensure future generations of Georgians will continue to have a thriving place to call home." The award is presented on behalf of Career Communications Group's US Black Engineer and Information Technology magazine, the Council of Engineering Deans of Historically Black Colleges and Universities, host Lockheed Martin Corporation, and sponsor Aerotek. 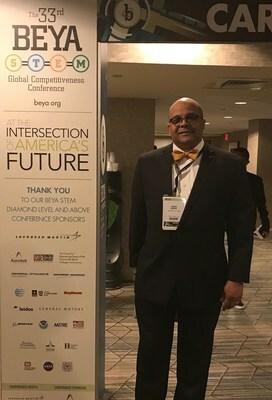 The 33rd annual BEYA STEM Conference kicked off on Thursday, February 7, 2019 with a full day focused on the contributions of America's diverse talent.